This entry was posted on 24 June 2014 at 20:18 and is filed under e-learning development, technology, usability. You can subscribe via RSS 2.0 feed to this post's comments. Good article and your assessment of the ‘average Joe’ factor is absolutely right. Thanks for introducing me to the Hype cycle as well. Thanks Phil, and you’re welcome! 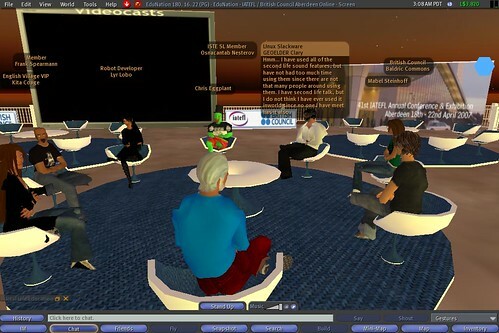 Hey Ryan – great reflection on Second Life – I remember all the hype about it – reminds me a bit of the current MOOC hype. Stay tuned for the MOOCs and Average Joe blog post…. Thanks for your comment, Con. When you say you don’t think the current MOOC model caters for the Average Joe, do you mean in terms of consuming them or producing them? I look forward to your blog post. Hi Ryan – good question. In all such situations I use the Con test because I see myself as an “Average Joe”. I think that the MOOC model fails predominantly on the way they are structured / designed ( so I assume this is the producing part). It also has some faults in the way they are promoted (i.e. consumed) – that is accessed and how they deliver on learner expectations. More on the upcoming blog post. You’re right. Life’s too complex anyway – simple is good. Sometimes we forget that and then we wonder why it all died away to become just another fad. Thanks for the blog post! Wow, doesn’t everything date so quickly! There is a moral to the story here. I thought Second-Life had some very real potential for our organization a number of years ago. The population of colleagues was very dispersed and in small groups. What a great way to get people together! I was willing to do the up-skilling necessary, but once I got into it – YOWZA and like you, I consider myself to be fairly tech-savvy. I was waiting for the system to get easier to use, as other social companies were doing, but I never saw them really adjust and then I forgot about them. Out of sight out of mind. The customer has a funny way of deciding what they can and cannot handle, and what they want to learn and what they don’t want to learn. Second Life is a great example of this. Glad they appear to finally want to turn the corner and go with the road, rather than completely driving off the cliff. Seems every so often Second Life comes about in my life, but I think it’s an exception that didn’t follow the Gartner hype cycle. It made it through the beginning but never out of the trough of disillusionment. Makes me recall the beginning when it was first open for beta, I was one of those participants along with a beta tester for There which has been gone since then, but is now back. I used it on a personal level at that time but even after two experience of having it brought back into my life, I still am in agreement with you that it doesn’t cater enough to the average Joe. In both my undergraduate and graduate programs Second Life has been brought up to explore, even with some guidance. While there are some great things out there, it’s a challenge to find them, and use them, let alone create them. I too have attempted to create objects in it, and along with you have failed. I think it takes a programmer to actually create anything. I’m not sure Second Life will ever get out of that trough of disillusionment, but it will at least have its niche audience. Your statement crosses over to a lot of technologies, even Enterprise Social Networks which I wrote about. If it’s not ridiculously simple to use, it won’t get used. I was in a similar position, Shannon. Working for a corporation with 3 major offices in Australia, let alone the international offices, I too considered Second Life as a potential social forum that could link us all together in an engaging and meaningful way. I was particularly inspired by BNP Paribas’ (another financial services company!) use of the platform for recruitment purposes. But as a lone force in my organisation at the time, I didn’t have either their funding or the executive support to follow it up. I kept waiting for SL to offer corporate accounts — private spaces which only your employees could access, with pre-fabbed templates so that you can pick the look and contents of your environment without needing a PhD in virtual architecture — but it was never forthcoming. You say SL appears to finally want to turn the corner and go with the road, how so? I must admit I haven’t been keeping up with their activities. I remember There, Nick, and a couple of other competitors too. I looked at some of them as potential alternatives, but they seemed to suffer the same limitations. It’s funny you should mention ESNs because I experienced something similar with Twitter: while they wondering about how to monetise the system, I expected them to offer corporate accounts. Disappointingly they went with advertising instead (yawn), and Yammer stepped in to fill the void. I felt compelled to comment again as I didn’t mention it (but though it then forgot it) in my original post. I do have to disagree with you on the fate of responsive e-learning. My thought on that is more if rapid dev tools don’t go that route then they will go the way of the dinosaur, not matter how easy to use. Storyline is a great product, but with the release of Captivate 8, it has some very important catching up to do. I suggested this to them nearly a year ago, and if their next release doesn’t combine their current ease of use with the features to cover various device sizes, the tool will lose relevance very rapidly. If Storyline does stay at the top of the heap without adding these very important mobile features, then it’s just a testament to how behind the times L&D is. It’s not just up to the tool developers to create the latest and greatest tech, it’s up to the practitioners to demand the best. We have to offer what the end user needs, even if they don’t know they need it yet. So, I love Storyline, but if the next release doesn’t address the lack of device support, it will become a dying technology. I’ll be forced to second guess my usage of it, and move to a tool that better accommodates the needs of the user. And that, I demand. Ryan – thank you for the reply! I just consider myself to be an optimist. I trip over the occasional article that SL is in the process of updating, albeit slowly. I think the beta will not be out until 2016, but any progress to make the experience a better one is good news. I will admit everything I read deals only with user experience once a location is built, not actually building the location – but one would hope that one includes the other. I also read the new (?) CEO isn’t terribly concerned about backwards compatabilty. Which to me is anther good sign, sometimes you just have to start fresh. I’m sure there are pros and cons to this approach, but at least they are talking about it. I would guess they have to – as I believe the retention rate is only 20% after 30 days. I know SL has been around for awhile but that business model cannot be sustainable for much longer. Proof, of course, is in the pudding – but I still believe the potential is great, if it is easy – as you say for the Average Joe (and accessible/easy/secure for the Average Corporation too). Well a big gripe I have with Storyline is the problems I have with playing its output properly on the iPad. Articulate claims to have fixed the problem by creating a mobile player app, which works great, but it’s only xAPI compliant! My LMS is not. I actually agree with you about responsive e-learning design. My implicit thought is that it will rely on authoring tools to implement. Of course we can always have a RED framework, but if we have no means to apply it, we shan’t. Such an opportunity to stand out in the competitive authoring tool market! Sounds like I need to investigate Captivate 8 and take another look at SL! You should try Protonmedia. This is a simple second life type of environment, all be it limited in scope built on top of Microsoft Lync. So it’s a Lync session on steroids. Easy to use and adds a little more fun to the experience. It’s a toe in the pond. I have been at web learning since I began with Plato and I have told many companies, until an ID’er can easily build a learning environment with all the objects and track the interaction it will never fly. Easy to create, easy to use. People are just learning to stop dumping information. We are light years away learning nirvana. Cheers David, and thanks for the tip re Protonmedia. This might be just the ticket for an organisation on a Windows environment. Most of the times we ask for ease, but we mean “customization”: we’d like a single perfect button to do anything in any moment. Fair comment, Alberto. Thanks for making it. Interesting- I also think that for many users, the cognitive and physical challenges of learning to operate in the environment often exceeded the challenge of learning the content! Like you, I was an early SL evangelist – but I was at a conference and the speaker said “hold up your hand if you can install and access Second Life at your office workstation” – about 3 out of 50 hands went up. That’s what popped the bubble for me- two barriers is two too many! On the bright side, in my despair I accidentally left our test space in SL unlocked and it turned into a dumping ground for people’s failed builds- after a while the neighbourhood went up market and the neighbours payed me enough Linden dollars to convert to A$75 just to leave so they could tidy up my virtual mess! That’s hilarious about the neighbourhood going up market!